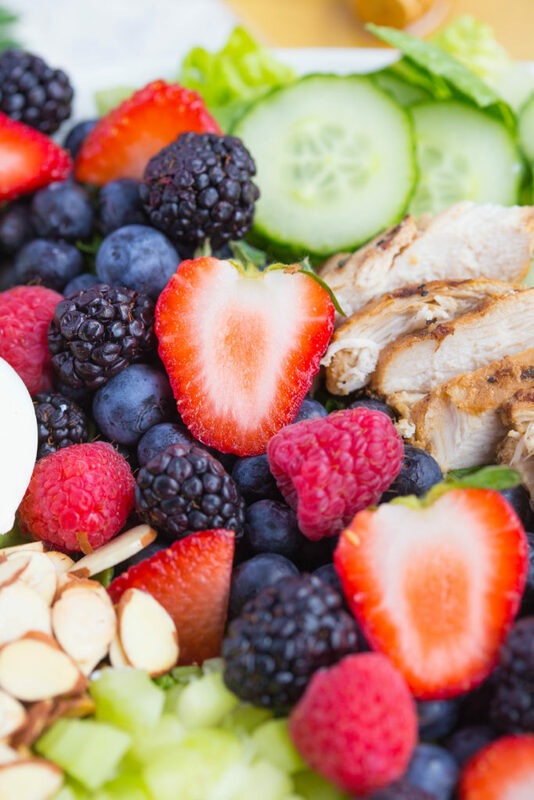 Mixed Berry Cobb Salad with Goat Cheese Vinaigrette is a show stopping salad that’ll look gorgeous on the table for baby showers, wedding showers, Sunday suppers, Easter, or a Mother’s Day brunch! Who doesn’t love a good Cobb salad? 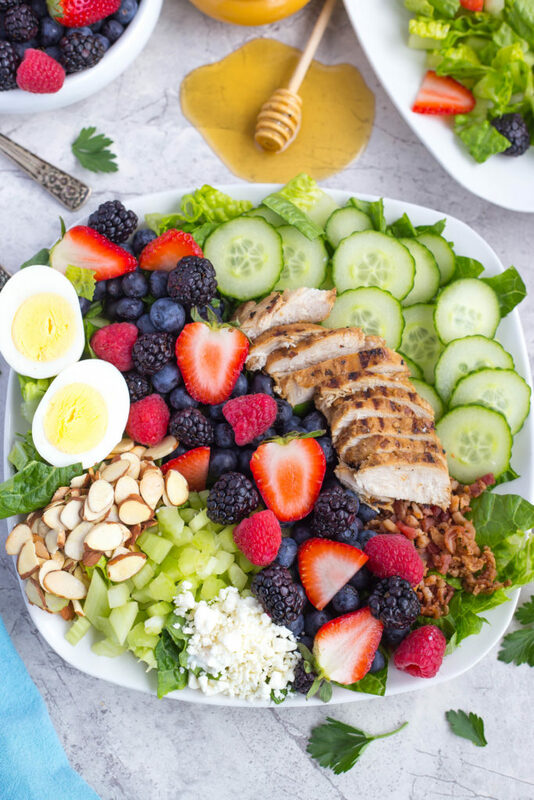 Loaded with meat, cheese, eggs, nuts, fresh fruit and veggies, Cobb salads are an anytime meal that will make you feel full, sassy, and satisfied each and every time. I am so very lucky to have a family full of salad lovers. Yes, that even includes my five year old! I’m sure having a salad bar at his school has helped with that. Hallelujah! So, my fridge is stocked with fresh fruit and salad ingredients at all times. This makes it easy for me to throw salads together on super busy nights or when I’m feeling like a hot mess. This Mixed Berry Cobb Salad recipe has most of the major components of a traditional Cobb salad. Grilled chicken, bacon, hard boiled eggs, and chopped lettuce fill the bowl, but you can always add cherry tomatoes and avocado if you so choose. Bleu cheese is also a major ingredient for Cobb salad but, if you ask me, the Goat Cheese Vinaigrette is so incredibly flavorful, bleu cheese is just not needed. Feel free to load up this bad boy with any other add in’s you’d like to throw in! I’m thinking dried cranberries, avocado, mixed peppers, and carrots, maybe? And, oh.my.gah, the goat cheese vinaigrette!!!!! It is absolutely to die for. It is such a showstopper, you’ll want to call up all your lady friends to see if any of them are pregnant or getting married just so you can throw them a shower and serve this salad. You could always just avoid that route and make it for Easter or a Mother’s Day brunch too. As with all of my salad dressing recipes, this goat cheese vinaigrette is super easy to make. This recipe does call for a food processor or a blender to zsoosh the ingredients, and I promise there is a reason for that. 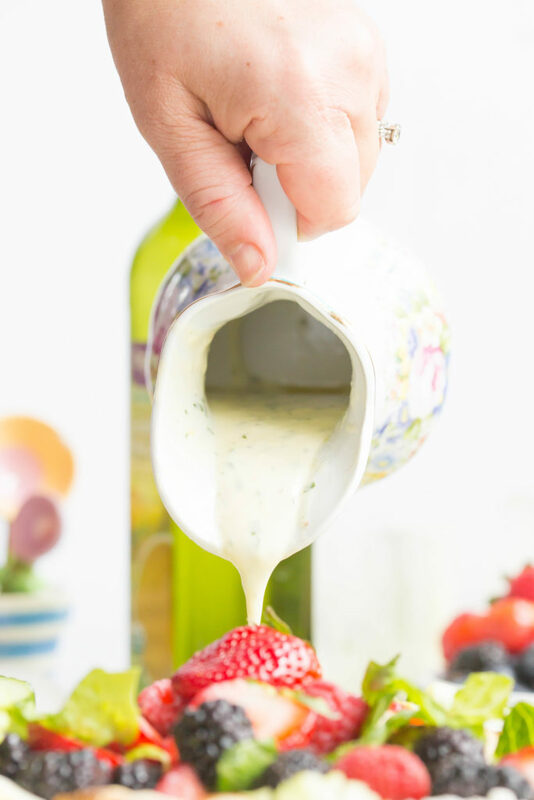 Blending it together breaks everything down so well, it keeps the oil from separating so the vinaigrette stays super creamy and dreamy. The Hubs and I love, love, love fresh fruit on salads especially in the spring and summer. I made this into a mixed berry Cobb salad because berries actually have the least amount of sugar, are absolutely gorgeous this time of year, and they marry beautifully with the Goat Cheese Vinaigrette. Oh! I almost forgot! Be sure to stir in the fresh herbs at the very end once you’ve gotten the vinaigrette the way you like it. If you add the herbs to the blender, it will turn the dressing green, and that’s not what we’re going for here. Make goat cheese vinaigrette and set aside. Add sliced almonds to a dry sauce pan and turn to low/medium low. Gently stir until the almonds become fragrant and turn lightly brown. Remove to a plate to cool. 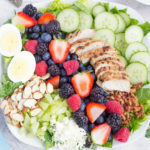 Spread lettuce onto a large platter, then add rows of mixed berries, grilled chicken, bacon, eggs, almonds, celery, cucumber, and any additional add ins you choose. Drizzle w/ goat cheese vinaigrette and serve. Add goat cheese, vinegar, lemon juice, and lemon zest to a small food processor and zsoosh until smooth and no clumps remain. Drizzle in olive oil and blend until perfectly mixed and pourable. Blend in hot water, 1 tbsp at a time if needed, until the desired consistency is reached. NOTE: You shouldn’t need more than a tbsp or two. 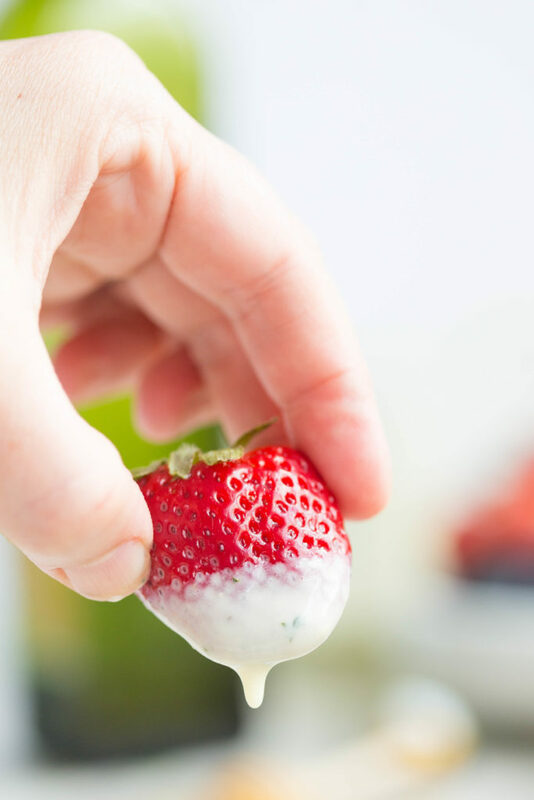 Gently stir in fresh herbs and pour over the mixed berry salad. Homemade Amaretto and Maple Bacon Baked Beans…in the Crock Pot!